The school district election results are in, combining the results from Durham on Tuesday, Madbury on Thursday and Lee on Saturday. To no one's surprise, the two candidates for the two school board seats both won. Congratulations to returning board member Denise Day and new board member Michael Williams. We wish you both good luck over your three years terms. There's a school board meeting scheduled for this Wednesday, 3/22/17, but with the delayed voting, it's not clear that Denise and Michael will be certified in time to vote at that meeting. Congratulations to Richard Laughton, reelected moderator after running unopposed for the umpteenth time. Congratulations to the board and the district administration for all their articles passing by wide margins. Thanks to outgoing board member Sarah Farwell, who chose not to run for reelection, for her excellent service over the last three years. Thanks to outgoing student board member Troy LaPolice, for his always informative contributions to the discussion over the last year. Turnout was around 1808 (the maximum votes for any question), relatively low for our district, which usually attracts between 2000 and 3000 voters, depending on how contested the district and town elections are. The dearth of contested races on both the district and town ballots, together with the disruptions caused by the storm, are presumably responsible for low turnout. Shall Oyster River High School continue to provide a large range of athletic programs, excluding football? I really only ever saw the folks in favor of football campaigning. (That's not totally true, I just remembered a letter to the editor against football from Dr. Bob Barth.) 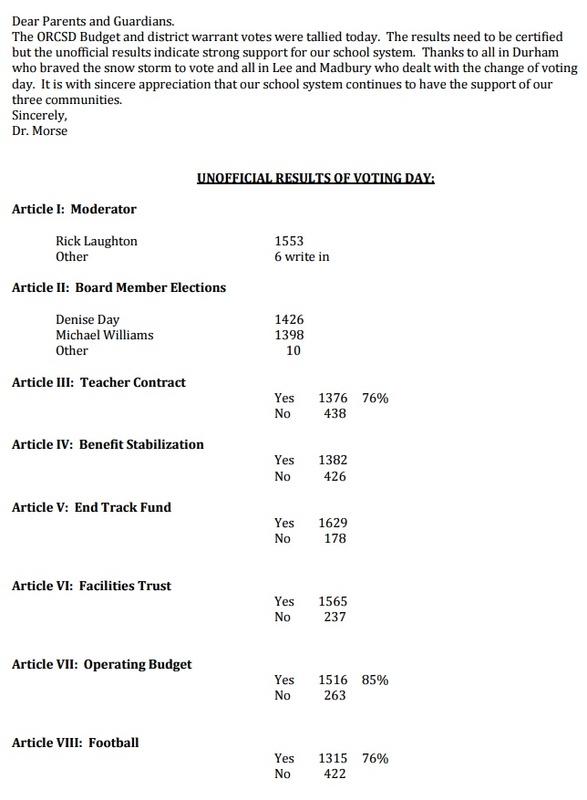 Nonetheless, the district voted YES by a wide margin, 1315 YES versus 422 NO. That's 76% YES, 24% NO, a rejection of football by a large margin of 52%. I'd like to think this puts the issue to rest for a while; we'll see. Thanks to Lee voters for voting down the SB2 repeal by a large margin. There's not much to say about the rest of the district ballot. I'll include without comment the unofficial results as reported by the superintendent. My previous post includes the exact text of the ballot.